Virtual Case Management® is a privately owned North American corporation specializing in software and business development solutions. Designed by analysts, investigators and legal case managers that have the acute sense for organizing a case structure for a controlled auditable outcome. Our Development Team was vast with numerous high level career experts currently using and providing feedback over the years. Founded in 2007, VCM is a SAAS (Software As A Service), a web based application; designed from the ground up with SECURITY being the utmost importance. Our Microsoft certified software engineers designed VCM with security at its core, from the very way the coding was written to the secured 256-bit encryption, FBI certified (FIPS 201) biometric access, and hosting solutions that are (SCIF) compliant; surpassing DOD and NSA Standards. VCM is the ONLY CRM case management solution with QuickBooks Sync, FBI certified biometrics (MINIX), Direct-Scan (Access scanners, webcams, forensic microscopes…etc.) and hosting solutions surpassing DOD/NSA standards (SCIF). Virtual Case Management utilizes 256bit encryption so all your case and communication taking place is encrypted and secure. VCM is committed to only offering you the highest quality most secure case management solution. Having this kind of trust gives you the confidence in knowing your entire transaction from the log-in to the log-out is completely secure. An SSL certificate is created for a particular server in a specific domain for a verified business entity. Like a passport or a driver’s license, an SSL Certificate is issued by a trusted authority, the Certificate Authority (CA). Each SSL Certificate contains unique, authenticated information about the certificate owner. Secure Sockets Layer (SSL) encryption works by encrypting sensitive information during online transactions. An SSL Certificate consists of a public key and a private key. The public key is used to encrypt information and the private key is used to decipher it. When a Web browser points to a secured domain, a Secure Sockets Layer handshake authenticates the server (Web site) and the client (Web browser). Virtual Case Management requires a user name and password by default to access the system. However we also offer the ability to bypass the password by entering in a biometric sample; this assists in the protection against hacking utilities…i.e. Dictionary Attack Utilities. After conducting extensive research, we located the leader in MINEX certified government grade biometrics, SecuGen an NIST certified, MINEX-compliant template extraction and matching algorithms security solution. SecuGen has been tested and approved for use in the U.S. government's Personal Identity Verification PIV program as defined by the FIPS 201 standard. SecuGen is listed in the U.S. GSA's FIPS 201 Approved Products List. Virtual Case Management took this approach due to only wanting to offer the most security biometric solution. You can learn more about our partnership with Secugen by reviewing their latest press release. Who else uses SecuGen Sensors and algorithms? Customers from 60 countries include; Fortune 500 companies, leading security and biometric companies, original equipment manufacturers, the financial and healthcare industry and many government offices. If your organization requires a different type of biometric sample, e.g. iris, voice…etc. 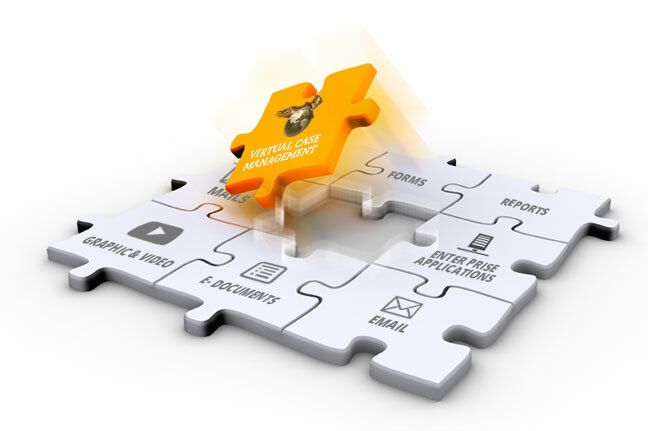 inquire at support@virtualcasemanagement.com and we can develop this for you. We offer biometric scanning devices as stand-alone units or readers incorporated into keyboards and mice. Virtual Case Management offers two types of hosting solutions, very secure and extremely secure. VCM protects you against power outages, hurricanes, disasters, and computer theft! ALL Standard packages are placed on secure servers ONLY within the United States, and we partnered with Softlayer.com a global leader in IT/hosting solutions. Virtual Case Management also offers (for an additional fee) compliant IT Hosting Security for Federal Agencies, Government Grade High-End Secure Servers with SCIF/ FISMA hosting solutions that surpass security requirements by the Department of Defense (DOD) and NSA (National Security Agency). The Federal Information Security Management Act (FISMA) was signed into law in December 2002 and requires each U.S. federal government agency to implement and support standardized IT security controls as defined by the FIPS 201 standard. We partnered with www.datapipe.com/government for our government contracts or businesses requiring a more robust security option. A known leader in the Federal Government for storing sensitive applications; SCIF and FISMA- audited hosting solutions. VCM offers the following security standards: FISMA, SCIF, FIPS 201, DTISCAP,MINIX, Sarbanes-Oxley, HIPAA, NIST, and PIV. Stop missing business opportunities because of FISMA requirements and sign-up with VCM today and promote your business obtaining government contracts today! We can't emphasize customer service enough! Automation should be used to help you accomplish your work quickly and effectively, but it shouldn't take over the entire process of a company. When you call into VCM, your get a live agent ready to assist you, answering all your questions by phone or by an online web meeting. We provide online training to one or groups of people and we have a large FAQ section along with online video tutorials. Your business is important to us. We value it and appreciate you choosing Virtual Case Management as your case management and business solution. We partnered with the best certified companies in the industry, trusted by their customers such as Apple, Lockheed Martin, NASA, and Intel, to provide fully secured and ecrypted system for high level of security. A Microsoft Gold Certified partner to provide our “Direct-Scan” access. The VCM “Direct-Scan” feature allows different types of equipment (scanners, webcams, forensic microscopes…etc.) to send digital data directly into the cases attachment section. Dynamsoft has customers such as, Apple, Lockheed Martin, NASA, and Intel. Providing us FIPS 201 FBI certified biometric access and digital fingerprint retrieval. VCM offers two login screens, one with a user/password and the other ONLY allowing access through fingerprint. This assists with defeating hacking utilities, making the system more secure. SecuGen is the world's leading provider of advanced, optical fingerprint recognition technology, which is MINEX-tested/NIST-compliant algorithms. Partnered with one of the two top tier hosting providers in the world; with high-end secure severs within reinforced harden structures. All facilities have security guards, fire suppression, back-up generators, and access control systems. Our first tier is through Softlayer (www.Softlayer.com) an IBM company, a global leader in the IT/hosting industry. I have just had a chance to check out the new updates…WOW to the new changes, I sooo look forward to working closely with you all and to assist with recommendations, plus letting you know if we have any problems here in Australia. Well done…and thank you for taking our email suggestions on board. I sooo look forward to working closely with you all and to assist with recommendations. An appointment calendar and reminder section for general use is now located within the front screen. © 20014-2015 Virtual Case Management.